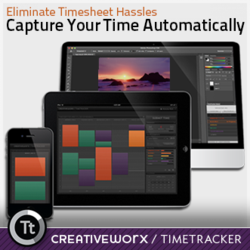 "CreativeWorx TimeTracker makes service companies more competitive by eliminating their timesheet madness." At Adobe MAX yesterday, CreativeWorx demonstrated the fundamental value of Adobe's new Creative Cloud by announcing that its TimeTracker solution is immediately available from within the Adobe Creative Cloud applications. TimeTracker lets creative professionals do their best work by eliminating the administrative interruptions related to timesheet preparation and submission. TimeTracker automatically and privately captures how people spend their time and then generates a timesheet on-demand for adjustment and submission. Financial systems are only as good as the data that goes in. The creative industries have had a notoriously difficult time capturing how time is spent. CreativeWorx has an innovative approach that improves accuracy while empowering creative professionals to focus on their craft, not their timesheet. The patent pending CreativeWorx solution can help every creative organization be more profitable automatically. With this release, Adobe Creative Cloud members can find, purchase & automatically install CreativeWorx TimeTracker without leaving their creative tool of choice…in just a few mouse clicks. One action installs TimeTracker in Photoshop, Illustrator, InDesign, InCopy and Flash Professional. Job ID’s are shared across applications so that time is automatically grouped for a job regardless of how the work is done. © 2013 CreativeWorx Corp. All rights reserved. Logos and trademarks are the property of their respective owners.